Somewhere between a yurt and a geodesic dome you will find the StarDome. 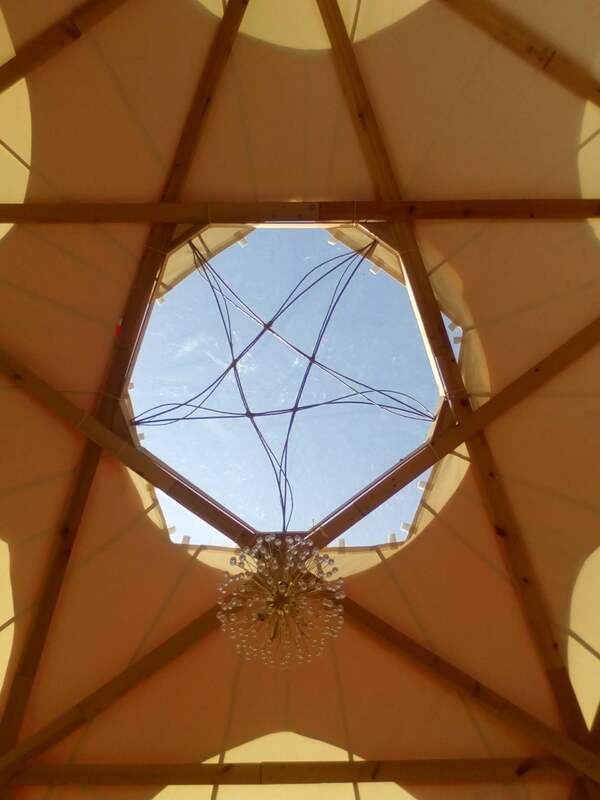 Curved wooden arches entwine to form a perfect hemisphere above your head and stars, triangles and pentagons are formed where the arches cross over each other. 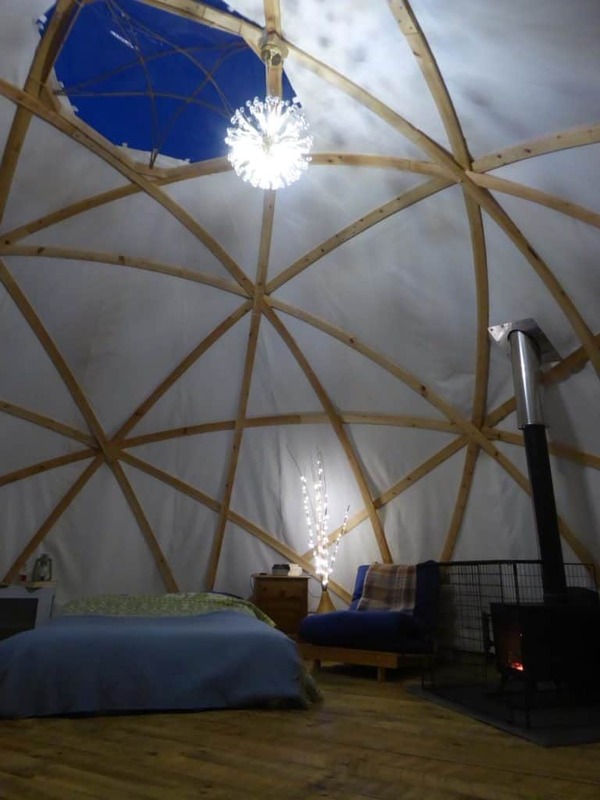 Covered in canvas, with a wooden floor beneath your feet and a window above you to the sky, the StarDome is your magical home on the meadow. And on the colder nights you can warm yourself by the wood burning stove. 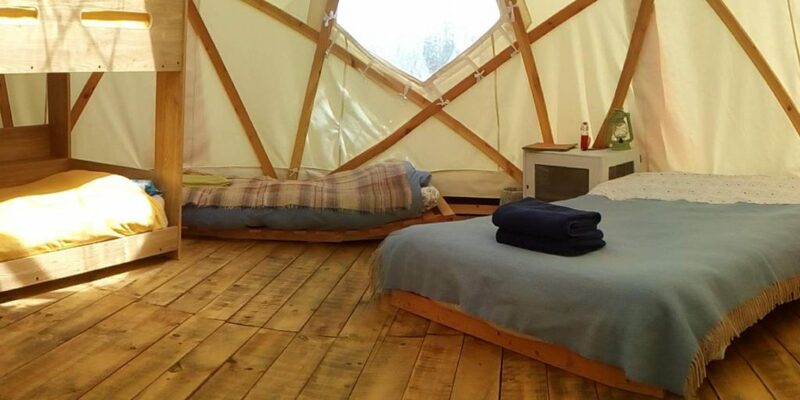 The StarDome sleeps up to six people, in a double bed, bunk beds and two single futon beds. It has its own area cut into the meadow with outdoor seating, a fire pit and campfire tripod and grill. If you prefer you also have access to the communal camp kitchen. It is lit with a central, solar powered chandelier and bedside solar star lights. 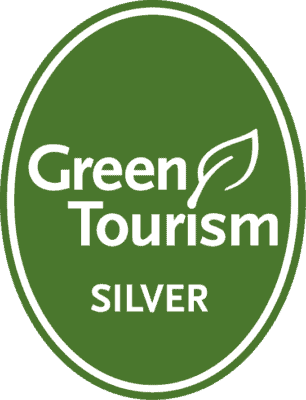 We provide linen and towels for seven night stays, but we aim to be as environmentally friendly as possible so we offer glampers the choice to bring their own linen from their beds at home for shorter stays. Please bring sheets, duvet covers, pillow cases and towels. 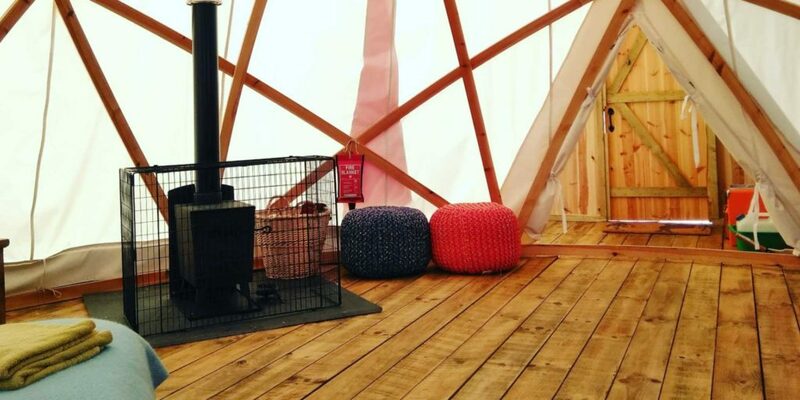 We appreciate, however, that you might be arriving late at night or just can’t fit everything into the car, on your bike or on your back, so we also provide sets that you can hire for a small fee (£5 per person per stay). We can also provide a travel cot on request. You might also find it useful to bring …..
Two night minimum booking (three over bank holiday weekend). No check-in on Saturdays or Sundays. Linen and towel sets are included for a 7 night stay. Sets can be hired for a fee of £5 per person per stay. Sleeps up to six people. Three nights from Friday to Monday, four nights from Monday to Friday or seven nights from Friday to Friday. Linen and towel sets are included for a 7 night stay. Sets can be hired for a fee of £5 per person per stay. Sleeps up to six people.